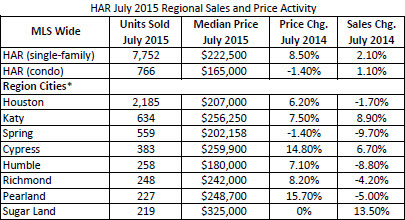 ​ HOUSTON - Houston Association of Realtors (HAR) has released home sales data for July 2015. The median price of existing single-family homes decreased to $222,500, down 1.7 percent from June 2015. Existing single-family home sales increased 0.8 percent from June 2015 for a July 2015 total of 7,752 sold units. Condos decreased in price to $165,000, down 5.7 percent from June 2015. Click Houston Market Research to see more quarterly reports.